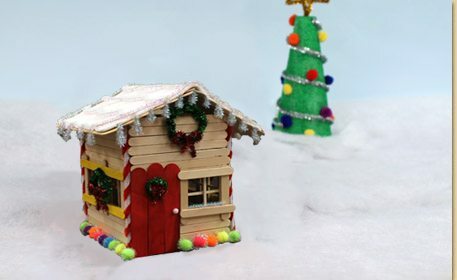 Decorate for the winter season with an adorable wood stick gingerbread house embellished with shimmer poms and shimmer sticks to add a snowy flare! 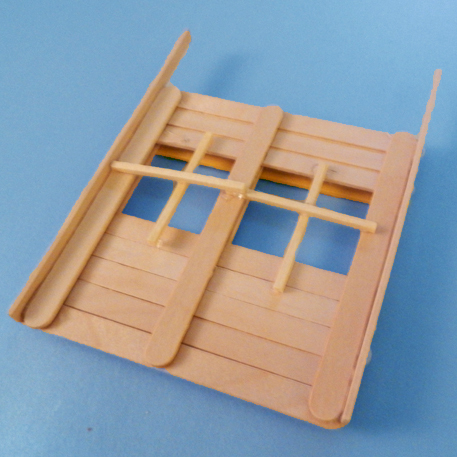 First for the back panel of the house, line up (12) wood craft sticks horizontally, as shown. Glue (2) crafts sticks vertically to the line of (12) to connect them all. Then glue a skinny stick in the middle. Set aside to dry. 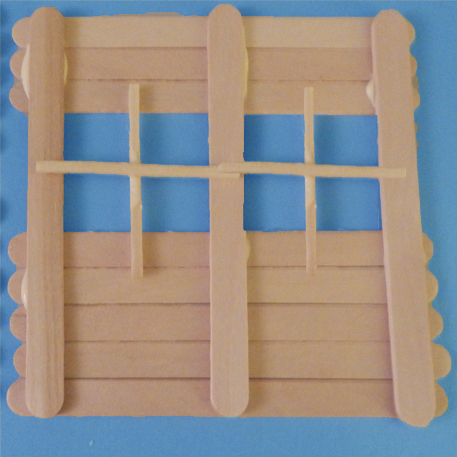 Next for the first side panel of the house, line up a group of (3) craft sticks and a group of (5) craft sticks horizontally, leaving about an 1 ½” of space in between. This space will be the windows. 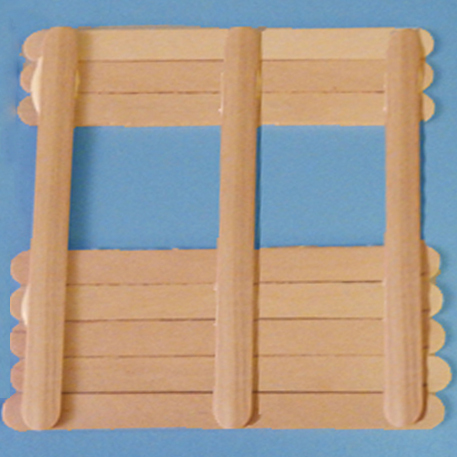 Glue (3) craft sticks vertically, spread apart as shown. 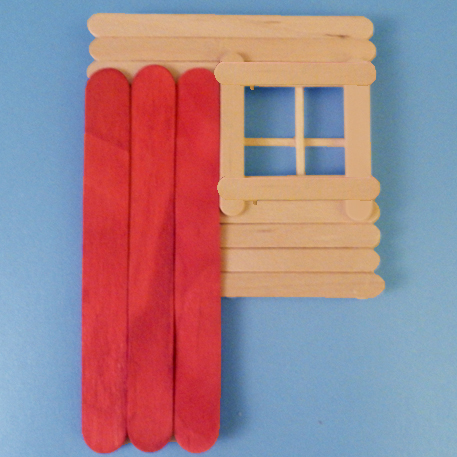 Then you will create the window panes using (2) mini sticks for each window. Create a cross across the empty spaces from Step 3, as shown. Flip this panel over and glue (3) mini craft sticks lined up with the (3) craft sticks that hold the other side. 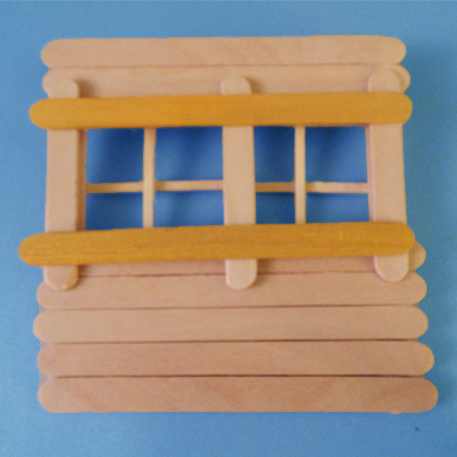 Finish off the window by gluing on (2) yellow craft sticks, as shown. Flip the panel over to the back side again. Finish off the first side panel by gluing the edges of a skinny stick to each edge of the panel. Repeat Steps 2-7 to create the second side panel. 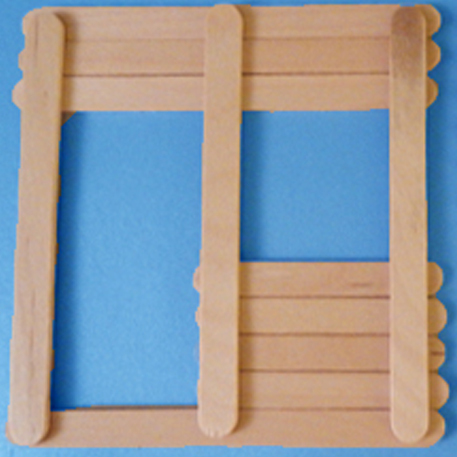 For the front panel of the house, line up a group of (3) craft sticks and a group of (1) craft stick and (4) mini craft sticks horizontally. 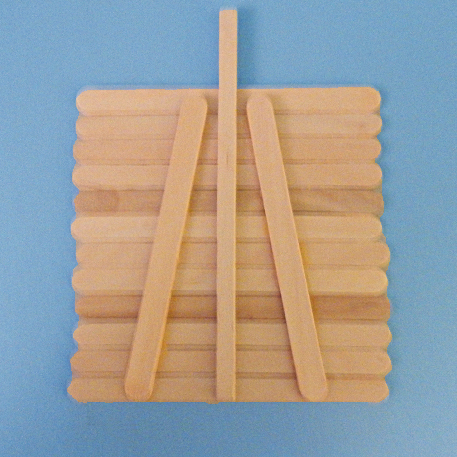 Leaving about an 1 ½” between the two groups, glue (3) craft sticks vertically spread apart, as shown. 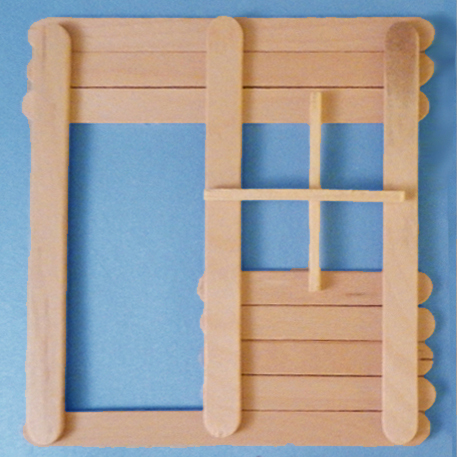 Add window panes using (2) mini sticks, the same as in Step 4. Flip over the front panel. 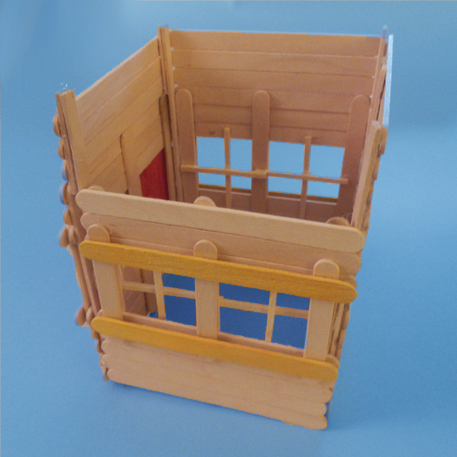 Cover the larger empty space with (3) red jumbo craft sticks and glue down. 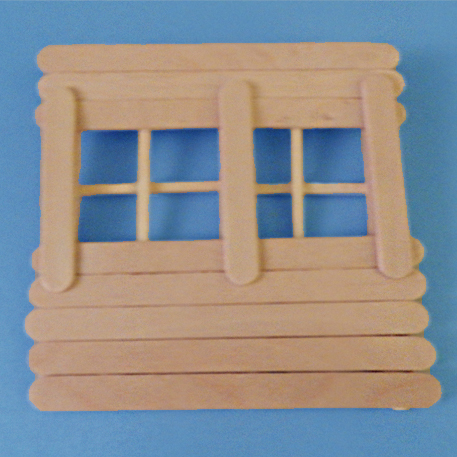 Add (4) mini craft sticks to frame the window. Cut off the excess red jumbo stick. 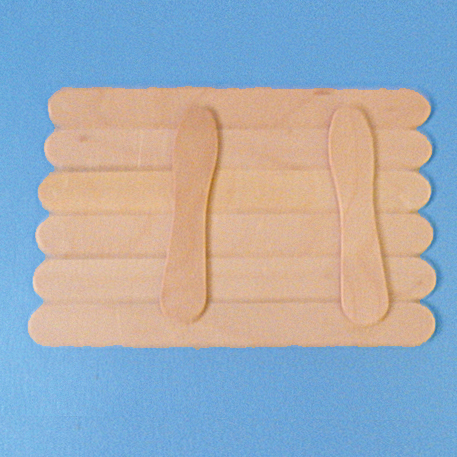 For the roof panel, line up (6) jumbo craft sticks horizontally and glue on (2) wooden spoons vertically. Repeat this step for the second roof panel. 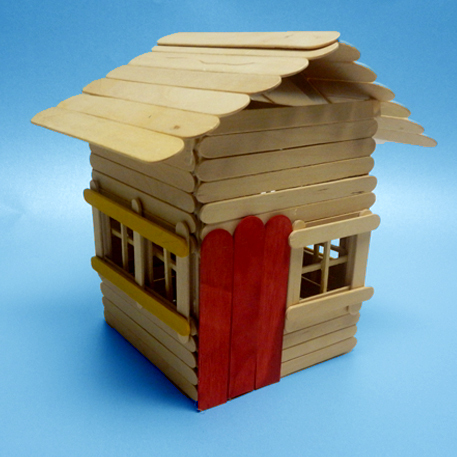 Add additional sticks to the top of the skinny sticks and glue your house together! Let dry before putting on the roof panels to ensure stability. Once the rest of your house is dry, glue on the roof panels. Glue a jumbo stick in the middle to cover any empty space there may be. Decorate! 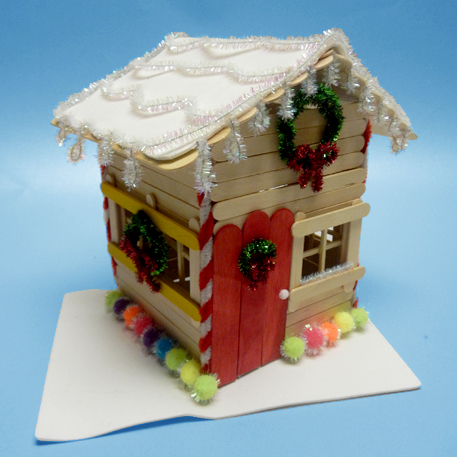 We used craft foam for our base and roof and embellished with shimmer poms, shimmer sticks and glitter sticks!